Unscented battery operated candles are one option to consider if you suffer from serious fragrance allergies. If you're concerned about the link between candles and fragrance allergies, LoveToKnow Candles is here to help. Fragrances causing allergic reactions can be found in many common everyday personal care products, including colognes, makeup, shampoos, antiseptics, and toothpaste. Even items such as cleaning supplies, laundry detergents, and insecticides may cause an allergic reaction in certain individuals. Doctors can test for fragrance allergies by using a screening agent called the fragrance mix. This is a combination of the eight individual fragrance ingredients that have been found to cause the majority of allergic reactions. It has been estimated that fragrance allergies affect 1-2% of the general population. Fragrance allergies are most common in women of childbearing age, but can affect people regardless of age or gender. Contrary to popular believe, having allergies doesn't necessarily prohibit you from enjoying home fragrance. Millions of allergy and/or asthma sufferers are able to be around scented candles with no problems. However, the fragrances used in candles can cause a problem in individuals with extreme sensitivities. Headaches or difficulty breathing are the most common symptoms of an allergic reaction to the scent used in a burning candle. Invest in clean burning, environmentally-friendly soy candles. Studies have shown people with allergies tend to have fewer problems with scented soy candles compared to similar products made from paraffin wax. Consider choosing candles made with essential oils. Some people who react poorly to artificial fragrances do not have problems with candles that use essential oils. When possible, choose single note fragrances over those that contain multiple scents. A single fragrance, because it is less complex, may be less likely to cause an allergic reaction. Always burn candles in a well-ventilated area. Only burn richly scented candles for a short time or consider using a candle warmer to subtly disperse the scent. If you know a local craftsperson who has a candle making business, consider commissioning him or her to create custom unscented candles to fit your specifications. This will allow you to have candles in any size, shape, or color you desire. Battery operated flameless candles are typically unscented, which makes them a great choice for people who are concerned about the link between candles and fragrance allergies. Additionally, since battery operated candles do not have the safety hazard of an open flame, they are ideal for using in homes with small children. 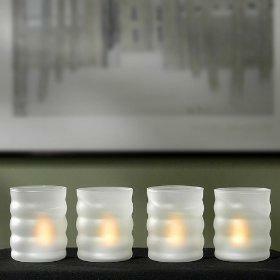 To make these candles look more realistic, a flickering light and edges made with faux melted wax are often used. For more information about purchasing flameless candles, please review our Unscented Battery Operated Candles slideshow.